The meat of black pigs bred in Finca Sa Cova Vella is intended to prepare tipical Majorcan sausage “sobrasada” . In the traditional Majorcan diet, the sobrasada has an undeniable weight, not only as the protagonist of a good slide of buttered country bread, but also as a condiment in cooking or as an ingredient in the preparation of sweets. Sobrassada appears in many recipes of stews and meat stuffing. In soups, rice and noodles and as a stuffing for pies and other pastries. Even in fish dishes. Also in the contemporary kitchen it is incorporated as a flavoring and natural coloring. 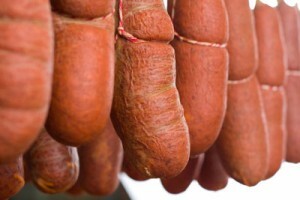 Sobrasada is a traditional cured raw sausage sausage that is made from lean raw pork meat finely chopped. The mixture is seasoned and kneaded with salt, pepper and abundant paprika In fact, paprika was incorporated into the local diet in the late seventeenth century and explains the distinctive red color of sobrasada. This paste is stuffed into hog casings and allowed to cure for weeks or even months. Unlike other sausages ,sobrasada de Mallorca mature in warm and humid climatic conditions. In Finca Sa Cova Vella black pigs are bred with a diet based on barley, beans, figs and carob. Unlike the Iberian pork, acorn is not part of their food. It is verified that the animals have open field surfaces to ensure growth in a totally natural environment. Ancient typical countryside house in Mallorca situated in the Manacor valley, in the West of Majorca. At only 5 km far from the village of Manacor, and 17 km from Porto Cristo. This former Arab farmhouse, named Maimo Azermico is already documented in 1239, a few years after the conquest of the island.